Lucy leaves Harry's employ to work with comedian Flip Wilson, but finds herself relegated to sorting fan mail. She gets fired for trying to get Wilson's autograph. 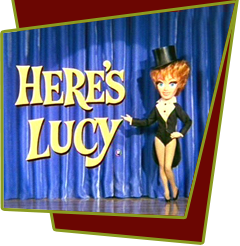 Lucy then comes back disguised to talk Flip into appearing as Prissy in a local production of Gone With the Wind, with Harry as Rhett Butler, Lucy as Scarlett O'Hara, and Kim as Melanie. Special Notes: Lucille finally gets to play Scarlett O'Hara; she auditioned for the 1939 movie classic when it was orginally being cast. Despite being the season premeire, Craig's absence is not explained. We learn later in the season that Craig is off at college. Writers, Bob Carrol Jr. and Madelyn Davis return to breath fresh air into the series. This is the first time they have written a script for Lucille since The Lucy Show, episode #58 "Lucy Enters a Baking Contest" due to a frustrated working relationship.